The Disney franchise, Pirates of the Caribbean is back to the big screen. The movie which is the fifth instalment in the franchise will be showing in Nigeria Cinemas from Friday 26th May. This adventure-fantasy movie subtitled ‘Dead Men Tell No Tales’ which had its VIP screening on the23rd of May, 2017 at the Filmhouse Cinema IMAX, Lekki is being sponsored by Etisalat Nigeria and distributed in Nigeria by the leading distribution company in Africa, Blue Pictures. 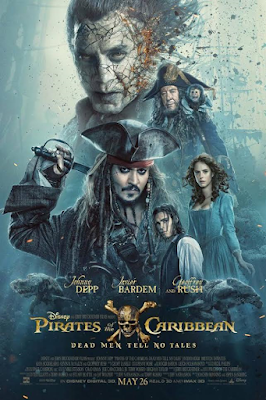 A Production of Walt Disney Pictures, ‘Dead Men Tell No Tales’ continues the adventure of a down-on-his-luck Captain Jack Sparrow who thrust into an all-new adventure, feels the winds of ill-fortune blowing even more strongly when deadly ghost sailors led by his old nemesis, the evil Capt. Salazar (Javier Bardem), escape from the Devil's Triangle. Jack's only hope of survival lies in seeking out the legendary Trident of Poseidon, but to find it, he must forge an uneasy alliance with a brilliant and beautiful astronomer and a headstrong young man in the British navy. Written by Jeff Nathanson and directed by Joachim Rønning and Espen Sandberg, the movie stars an ensemble cast featuring Johnny Depp, Geoffrey Rush, Javier Bardem, Kevin McNally, Brenton Thwaites, Kaya Scodelario, Orlando Bloom and Keira Knightley. ‘Pirates of the Caribbean: Dead Men Tell No Tales’ is one movie to watch. It will be showing in all cinemas across Nigeria.